When the player is away from it, the actor is idle and emits a number of particles based on the amount of health points it currently holds. When the player enters it, the actor starts regenerating player’s health every second. Each time player’s health is increased, the actor’s amount of health points is decreased. Each time the actor’s health points amount is decreased, fewer particles are emitted. Each time this regeneration process takes place a sound indicating player’s health increase is played to provide feedback. When the player reaches their maximum health or steps away from the actor, the regeneration process is ended and the actor goes back to being idle. When the actor’s health points amount reaches 0 the actor becomes empty and can no longer regenerate player’s health. This will happen unless the level designer decides to make a specific instance of this class a never ending source of health points, so we need to provide the level designer with some form of control to do that. This fairly simple behaviour can be easily set up in UnrealScript using States, Functions and Events. If you are new to these programming concepts or if you want to see how they are used in UnrealScript I recommend reading this and this UDN documents. Before we move to discussing states specific to our actor we need to add three more variables to the existing class. So by default each HealthFountain will be set to run out of health points and it will play a sound of a UT3 Health Vial pickup when player’s health will increase. We will initialise the MaxHealthPoints later in a different way, outside of DefaultProperties block. By separating the behaviour into these three states, we can create functions that will only exist within a specific state. For example the healing function should only exist and be executed if the actor is in Healing state. What is more you can have the same function exist in all the states, but actually do something completely different depending on the state the actor is in. Finally you can have states ignore functions and events altogether (there is even an ignores keyword for that). In case of our HealthFountain we will see that no code will be executed when it goes into Empty state. event PostBeginPlay() – this is called when the level is loaded and immediately after play begins. As you can figure out from above code, when the level starts and the PostBeginPlay is called, we will call the PostBeginPlay of the parent class, and then we will initialise MaxHealthPoints with the value from HealthPoints. Finally we pass a value into the SpawnRateParameter of the ParticleSystemComponent we created earlier, a float value that comes from dividing current HealthPoint by MaxHealthPoints. It will be 1.0 when the level starts and HealthFountain is still full of health points. In the Heal function we first create a local UTPawn variable called P. We will need this to get access the UTPawn object colliding with our actor (that UTPawn is of course the player). Remember that all local variables need to be declared at the start of the function, otherwise you will get an error when compiling the scripts. This allows us to iterate through all UTPawns currently touching our actor. Once we get the UTPawn touching our actor we need to check if that UTPawn’s Health is not at maxium. If it is, we need to stop regeneration process and move our actor back to Idle state. Otherwise, we heal the UTPawn by adding HealingAmount to its Health (making sure it does not go above the SuperHealthMax). And we play the HealingSound SoundCue. Last thing we need to make sure is that the HealthFountain gets its health points decreased and the SpawnRateParameter is updated in the particle system. We do that of course if we decide that our actor can go empty. That covers the Heal function for our actor. We also need to add an UnTouch event, which will transition our actor back to Idle state in case the player will step out the HealthFountain radius. Again we need to make sure that it is the player who is the instigator of this UnTouch event. Otherwise the Healing state could end when the player fires a weapon at our actor, which is undesirable. So when Healing state begins, the code after the Begin label will be executed. Heal function will be called once and then a timer will be set to call the Heal function in a loop ever second the actor is in the Healing state. For the Empty state, we leave it blank as we don’t want any functionality in that state. When in Empty state our actor should act as if it is switched off. This makes the HealthFountain functionality complete and as originally outlined in part 1. Once again let’s look at the video to get an idea how the actor works when placed in the level. If you are familiar with object oriented programming, you should be able to get up to speed with UnrealScript easily. UnrealScript is similar to Java, but it has many unique features that are more suited towards game programming. I highly recommend reading the UnrealScript Reference page at UDN to get a glimpse into its features. Apart from the official docs at UDN, it is also worth looking at source code delivered with UDK. After all, it contains a lot of example classes from an actual game, so why not do that? To get started you will need to set up your development environment. I won’t go into details on how to set it up, but instead I will share useful links to other websites that explain this process. 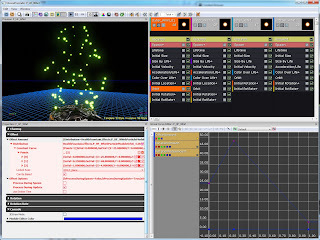 nFringe by Pixel Mine is a great tool to use with Visual Studio. You can find a simple set up guide here. When you have the tools installed you can follow this guide to configure the development environment. This is a very basic class definition. At this point the HealthFountain class does nothing more than the base Actor class from which it is derived. By extending the Actor class, the HealthFountain class has all the properties and functions of the Actor class. You can look into the Actor.uc file to see all the code in the Actor class. 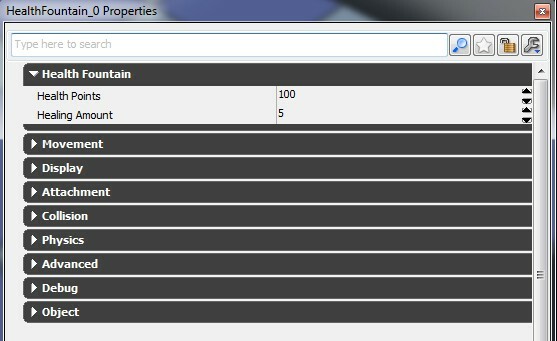 Notice the DefaultProperties block that follows class declaration. In this block you can initialise class variables to their default values and add Actor components. Let’s add more code to the HealthFountain class and make the actor visible in the level. The keyword placeable allows the class instance to be placed in the level by the level designer. The ClassGroup allows to specify the category in which this actor will be listed in the Actor Classes window of the Generic Browser. If we don’t specify that, the actor will be listed as Uncategorized. We can use the keyword notplaceable when we want to disable actor placement in the level. For example think of a base actor AmmoPickup that would not be placeable, but its more specific subclasses like PistolAmmoPickup or RifleAmmoPickup would be placeable. You will notice that we also added some variables to the class. In UnrealScript there are two kinds of variables and they have some specific rules to follow when using them. Instance variables (keyword var) are the variables specific to a class instance. They must be declared right after class declaration or within struct declarations. Local variables (keyword local) are used within functions and they are only active while that function is executing. They must be declared as soon as the function code starts. Also they cannot be initialised in the same line as their declaration. An example of that will be shown in later posts. Instance variables can also be exposed in Unreal Editor when we use var() keyword. So in the case of HealthFountain class above, the level designer will be able to change two integer values called HealthPoints and HealingAmount when they open the actor properties window (F4 in the editor). Next we have some more code in the DefaultProperties block. First thing that happens in the DefaultProperties block is a creation of a StaticMeshComponent (one of many types of Actor components, more on that at UDN). The new StaticMeshComponent is told to use the StaticMesh'Pickups.Base_Powerup.Mesh.S_Pickups_Base_Powerup01' pickup base as a static mesh. Notice the way you need to specify the full package and asset name. When the component is created, we then add it to the actor component array of our actor. After that we set the HealthPoints and HealingAmount to default values. This will mean that each time an instance of this actor is placed the level, it will have those values as default. These values can be changed by level designer, because we exposed them in the editor by using var() keyword. At this point the HealthFountain actor has its most basic code done. 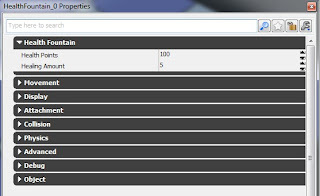 It appears in the Actor Classes window of the Generic Browser and can be placed in the level. Right now it only looks like a static mesh, and of course does not have any of the features discussed previously. We will add more Actor components and functionality to our custom actor in the next post. Before we jump into coding our custom actor in UnrealScript, it would be good to know what we are trying to achieve. 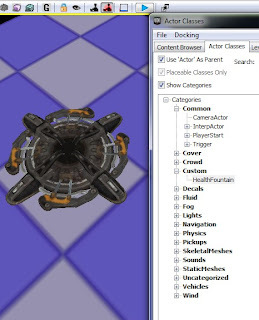 Actors are basically all gameplay and level elements that can be placed in a level. Think of static meshes, weapons, pickups, players etc. The image below presents the basic look of our custom actor that we will create. So what do we have here? 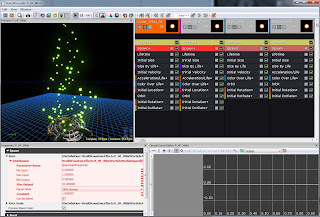 As you can see in the image, our actor consists of a mesh (standard UT pickup base), particle emitter and collision component (you can press C key in Unreal Editor to view collision). Later on you will find out that this actor also has a sound component, so that it can play sounds in the level. 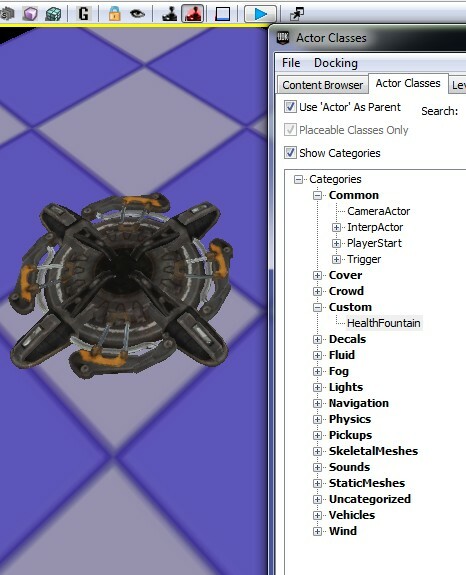 In Unreal Engine there are of course more Actor components than that. You can learn more about Actor components at UDN. Actor components are basically modules that add certain functionality to the base Actor class. Instead of keeping all the code and functionality in one class, you can simply decide which components you want your specific actor to have. Ok, so what exactly is this actor here? Well, I called it a HealthFountain. Imagine a safe spot in your level, where the player can slow down for a moment, take a break from beating all the bad guys and regenerate their health. This is where the HealthFountain comes in. The player can simply enter the fountain and restore health points (unless your game uses automatically regenerating health and armour, then this is pretty much useless). Stepping out of the fountain will stop the regeneration process. Also if player’s health was restored to the maximum, the fountain will stop healing the player. The HealthFountain has a health points limit though and once the health points run out, the fountain will be empty and disabled. How do we know that the fountain is running out of health points? Well, the amount of particles will let us know. The fewer health points are left in the fountain, the fewer particles will be emitted. I made an example video showing how this is going to work. In the next post we will jump into coding our custom actor using UnrealScript. The first day of a month seems like a good day to start something new. 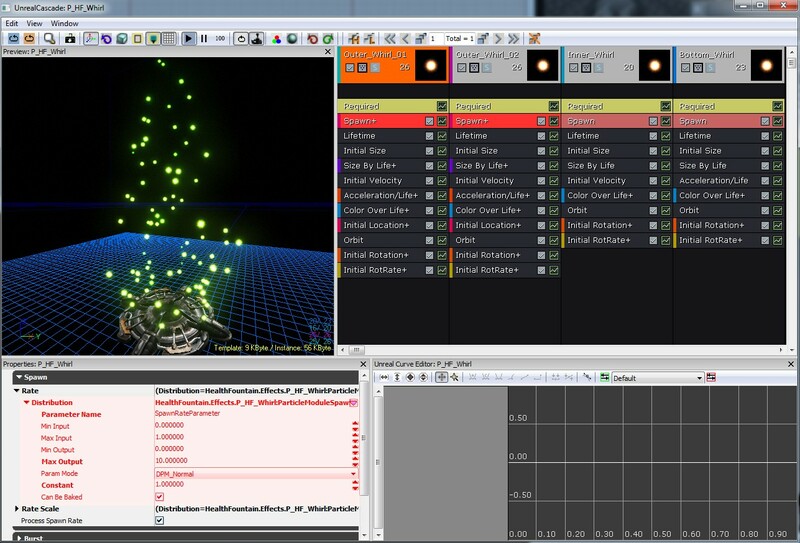 So here I am starting my personal blog about Unreal technology, UnrealScript and UDK content creation. All in scope of level design and game design, because I'm really interested in these areas of game development. I'm doing this for several reasons, but the most important of them all is that I want to help myself organise and document my learning process, to introduce some order into the chaos. Secondly, I hope that by committing to this, it will help me become better at writing and generally expressing myself. And finally, if at some point in the future this blog could help someone learn something new about Unreal, then I would be really happy. The next post will be a sort of introduction to UnrealScript, which is something I started learning a couple of weeks ago.